Orange, France is a town of about 28,000 population with Roman origins in Vaucluse department of the south of France, 21 kilometers north of Avignon. 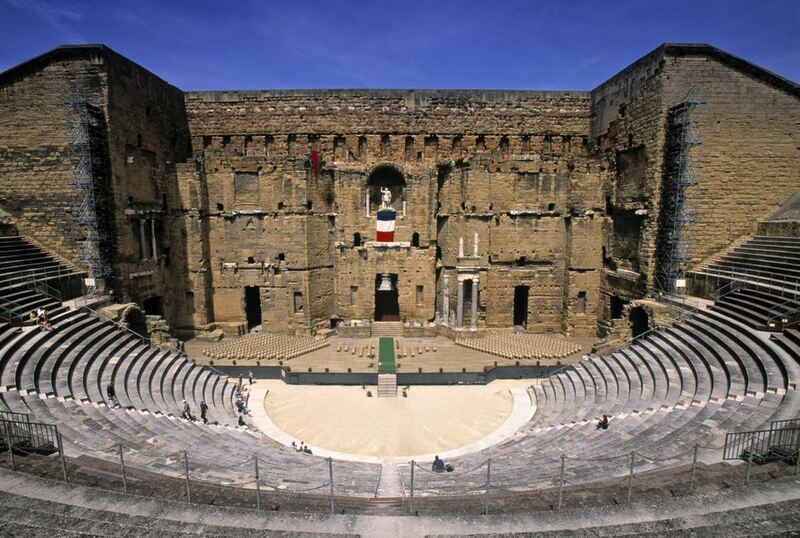 Known for its amazingly preserved Roman Theater, Orange is worth a night of a tourist's time--although for those who wish to just have a look at the town, the Roman Theater and the Triumphal Arch, a day trip from Avignon will do just fine. By Train: The Gare d'Orange is found on Rue P.
Semard. Orange is easily accessible by train from Arles, Avignon, Montelimar, Valence, and Lyon. There is car rental at the station and hotels nearby. By Car: Orange is east of the A7 Autoroute. The A9 Autoroute from Nimes, La Languedocienne, intersects the A7 near Orange. Here is a Google Map of the area around Orange. The amazingly preserved Roman Theater and Triumphal Arch, from the reign of Augustus, are the top sites in Orange. The Roman Theater is a UNESCO World Heritage site, added in 1981--the Arch was included later. Chorégies d'Orange Music and Opera Festival is held in the theater in summer. During the Middle Ages, folks built little houses inside the theater. These remained until relatively modern times and even hampered the restoration of the theater. On the other hand, the existence of them probably saved the theater from quarrying that would have taken place in order to build new housing. For Roman archaeology buffs, the excavations of the Roman Temple near the theater are also interesting. You can better understand the archaeology with a visit to the Musée Municipal on the Rue Roche which contains many artifacts from the excavations carried out in Orange and surrounding area, the most important being fragments of a property survey map of the area scratched into marble. It was used as a means of property taxation. The Orange Cathedral, the Cathedral of Notre Dame de Nazareth, is of Romanesque design built upon earlier structures that dated to the 4th century. A peek inside offers a chance to view many paintings and some Italian frescoes. Worship here ping-ponged between religions for a while. In 1562 the cathedral was sacked by Huguenots and converted to a Protestant church; it was given back to Catholic control 22 years later. During the French R evolution, it became a temple devoted to the "Goddess of Reason" and was returned once again to Catholic religious practices when the Revolution ended. Orange has a weekly market held on Thursdays in Rue de la Republique. A top-rated budget hotel in Orange is the two-star Hôtel de Provence - Orange at 60 Avenue Frederic Mistral, near the Gare d'Orange railway station (but also offers free parking if you're coming by car). If you wish to stay close to the theater, the two-star Hotel Saint-Florent is steps away. See our Provence Map for other attractions in the area. The Vaucluse department includes the famous Luberon, and the charming town of St. Remy is just beyond the department border to the south. Here is how we spent our Week in Provence, much of it spent in the Luberon and the Camargue, or you can just look at our Provence pictures.